Yesterday I bought a new gadget for the kitchen….guess what? Yup, a new claypot ! :)) I find the price a bit pricey and the boss doesn’t want to give me a discount, but since I wanted one so badly, I guess I have to pay like a Duchess ! 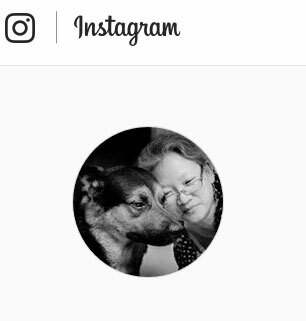 And….I also can’t wait to use it ^ * . I cooked tofu with it…a dish which is a favourite of the family… tofu , tofu , tofu . 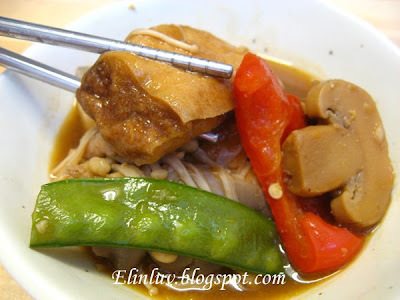 I can eat tofu everyday :) Simple and easy to cook and simply delicious…yum yum yummy . Serve it hot with rice…especially when it is still bubbling. 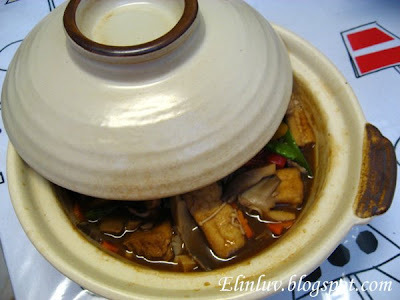 This claypot retains heat well and will keep the tofu warm thru out dinner. I love this claypot…big enough for a family of five or six. It can be used for cooking many other dishes besides tofu. :)) I heart the lid too ! 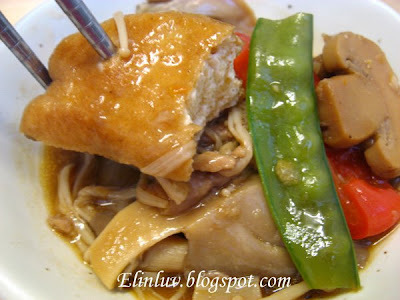 Cut brown tofu into halves and coat them with corn flour. Deep fried till golden brown. Drain off oil and leave aside. Add into the claypot, 2 tbsp of olive oil, sesame oil and the chopped garlic, slice of ginger and shallots and saute over medium heat till fragrant. Add in the shrimps and lean meat, stir fry till the raw meat is cooked then add in all the mushrooms and the cut vegetables. Stir fry for another 3 minutes. Add in 1 cup of water and all the seasoning ingredients except the wine. Boil for 6 minutes, add in the fried tofu and add in the thickening and wine. Cover the claypot with lid and simmer for another 10 minutes. Off the fire and served it hot with rice. * If you want more gravy add a bit more water. 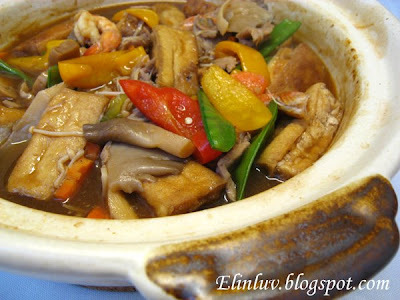 yet another delicious claypot . . . I just love tofu ! This looks so good! I've always wanted a claypot but I am not using a gas hob! I have a question re: the claypot. 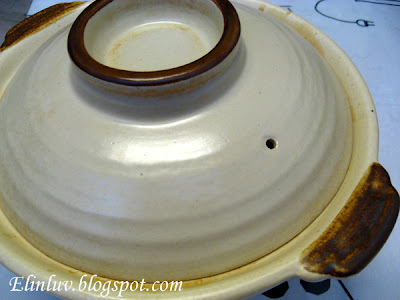 Did you need to 'season' the claypot 1st before using? Just wondering if it will break if placing it on high heat. @ Charming : Hi,according to the shop assistant, he told me to just add water to the claypot and when the water boils pour the water away. Then the pot is ready for use. It has a glazed finish on the inside. And it won't crack under high heat. This is of a better quality material. that's why it is pricey :) Haha I heart so much! @ Cindy Khor : I guess you can use kicap manis coz the amount used is 1 tsp only. It will taste just as good :) I used the dark soy sauce to add color to the dish :) so if you like you can omit the dark soy sauce. 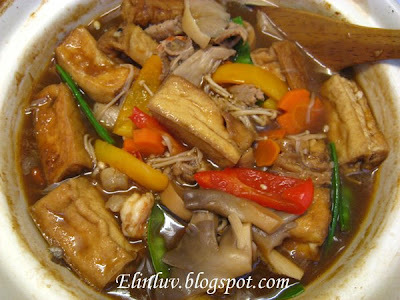 i always order this simple and yummy dish when we dine out. Does it HAVE to be cooked in a claypot or can a wok work as well? This looks soooooo good! I bought my first claypot a few months ago and still haven't used it! Now I have a good reason (and recipe) to finally put it to good use.